The L.E.F.T test or Lower Extremity Functional Test is a performance measure that includes every movement pattern an athlete may perform in sport. Agility tests like the L.E.F.T test can tell you a lot about an athlete because it requires a significant amount of eccentric strength along with the ability to reactively accelerate in a different direction. In order to perform at an optimal level, neuromuscular control is a must. Neuromuscular control and athleticism in a number of ways have the same meaning. 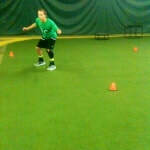 ​Modified Combine drills/testing is a research-based method specifically modeled for the athlete recovering from an ACL reconstruction surgery. 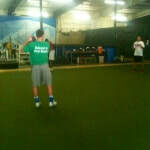 These are a series of drills/tests based on the activities performed during the NFL Combine. The focus is on cutting and shuffling movements of the lower extremities. The athletes ability to start, stop, cut and change direction is examined. 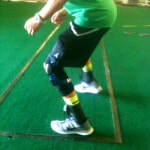 Over the years, we have worked with numerous throwing athletes recovering from a wide range of injuries. A throwing program is an integral part of their return. HPT has throwing programs endorsed by Dr. James Andrews (Birmingham, AL), Kevin Wilk, PT (associate of Dr. Andrews), Dr. Timothy Kremchek (Beacon Orthopedics/ Cincy Reds), the Oakland A’s and the Washington Nationals to name a few.